This the first 7-in-1 Combo on the market! (Climb, Slide, Bounce, Free-Fall, Rock Wall, Basketball, Rock n’ Roll). New to i2k is our brand new line of Deluxe Combo units. 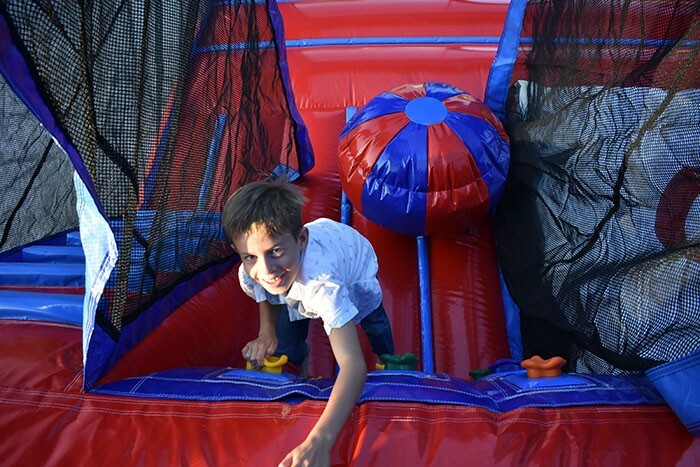 Like other combo units on the market, they feature a spacious bouncing area, but now also include various unique inflated obstacles leading to the climb up to the top of the slide platform. i2k’s Deluxe Combo also features a climbing wall with real climb holds and mini free-fall jump for those little daredevils. Dimensions: 20’ x 18’, Weight: 476 lbs. We bought the Toxic Monster a month ago at the EPA Expo and it is the new favorite of our indoor location! We also have had many inquiries for offsite rentals! Fantastic product. Well made, well thought out and the kids are loving it!